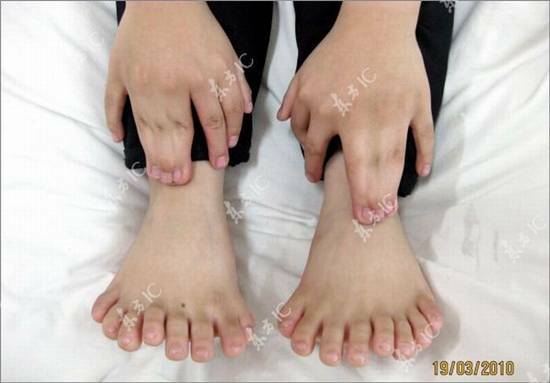 A 6 years old Chinese boy Chi-lin, has 15 fingers and 16 toes, which outnumber the current world record of 25. Currently, he is ready to undergo an operation at Shengjing Hospital in Shenyang, capital of northeast China's Liaoning province. 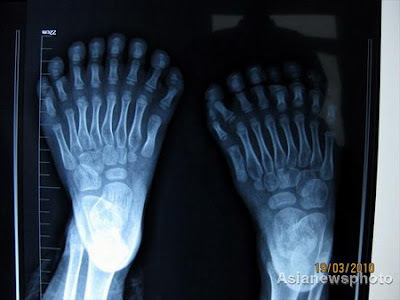 Here you can see the photo and x-ray of Chi-lin's fingers and toes. Yesterday Chi-lin gave one of the shocking performances on his school’s special functions. According to reporters, when little Chi-lin has agreed to reporters, "he was pull gently with your fingers, toes joints can also be used against to bend, fold easily into the 10 toes on the instep". When everybody saw this strange performance, number of people said that the small Chi-lin, head shaking like a rattle. The Small Chi-lin Joints are more flexible but reverse curvatures are very hard just like bone. Chi-lin belongs to local farmer family. He was born in Guizho. In childhood, small-chi-lin looked like other ordinary children. To 1-year-old Chi-lin, almost no experience of crawling period, learning to walk, stand up straight. So his mother thought Chi-lin had joint problems, instantly took him to a big hospital, the results of everything was normal. She also had taken him to Bishan County Hospital. As the Chi-Lin grew up in a day by day, she found that not only the Chi-lin's wrist, finger joints, toe joints can be reverse-folded, but other parts of the body joints are beyond the ordinary reverse curvature. In the recent time, 6 years old chi-lin wears a 8-year-old brother’s shoes for better move, and mischievous. Boy shows his hands: hand's pinky, pointer and big fingers are alone, but right and left hand ring fingers are Joint with other 2 fingers. And right hand thumb is joint with other little thumb. This is a Chi-lin toes photo. He has 16 toes, both legs have equal fingers. Normally, human’s leg thumb is bigger than other fingers. But His thumbs looks very small comparatively other fingers. 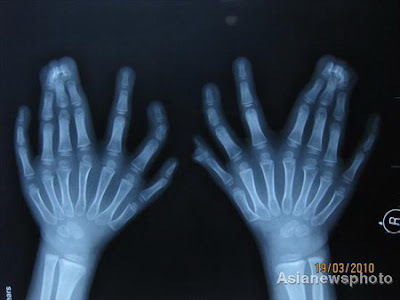 These are the X-ray of the hand and feet of the 6-year-old, where you can see every finger is joint with its separate bone, so finger divide operation is possible.